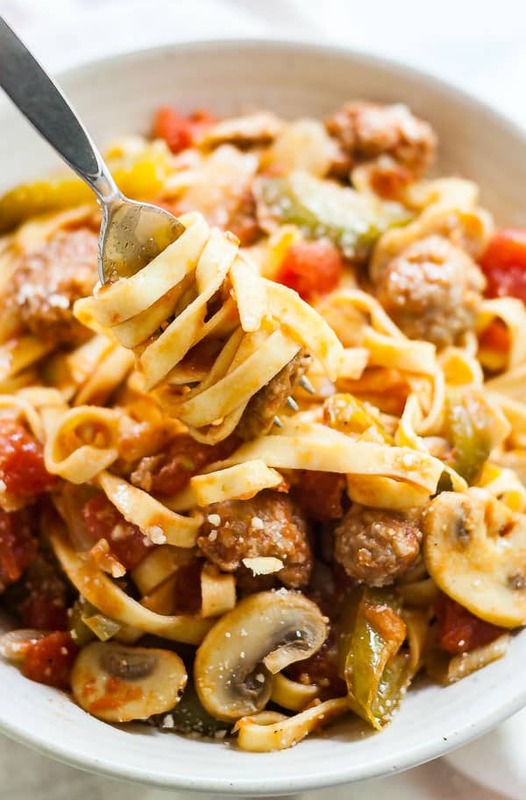 This Sausage Pasta with Peppers and Onions is a delicious quick and easy weeknight dinner for families and a great date night meal for couples! 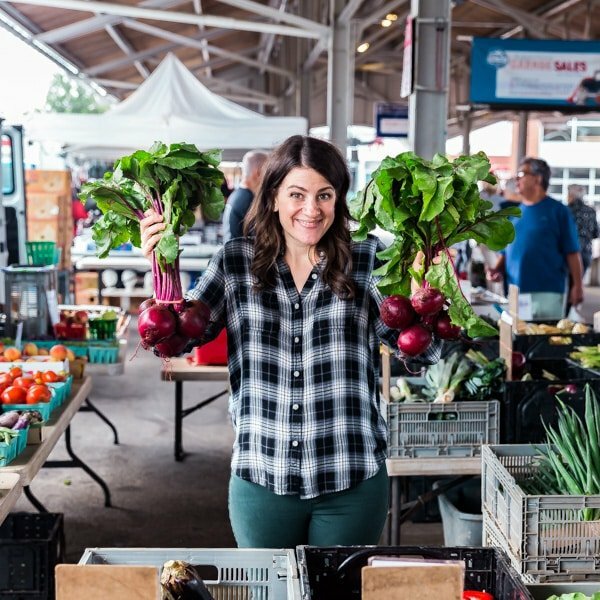 This recipe, you guys. I’ve been dreaming of it. I’m not even exaggerating. 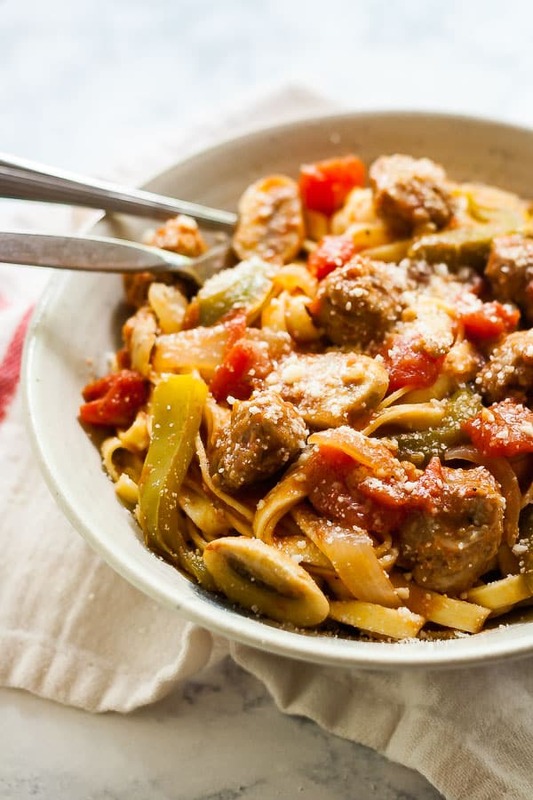 For months now, I’ve had this sausage and peppers pasta idea in my head, kicking around. I seriously could not stop thinking about it. Some mornings, I would wake up in the morning with this recipe playing in my brain, like a short film. Veggies sauteing. Sausage browning. White wine working it’s boozy magic. Tomato sauce simmering. I’m swooning just thinking about it. After I made my Stuffed Peppers Rice Skillet I had some leftover Italian sausage and pasta hanging out in my pantry (of course!). I knew I had to (finally!) make this pasta. My only regret is that I waited so long to get my act together and make this! I did the first test run on a busy weeknight for my family. And while it needed a couple of tweaks, for the most part it was pretty fantastic right out the gate. 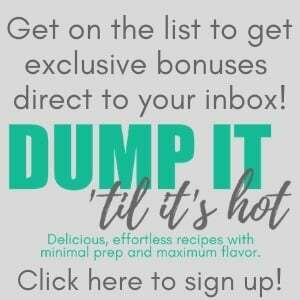 Once I implemented the tweaks there was no stopping this recipe! 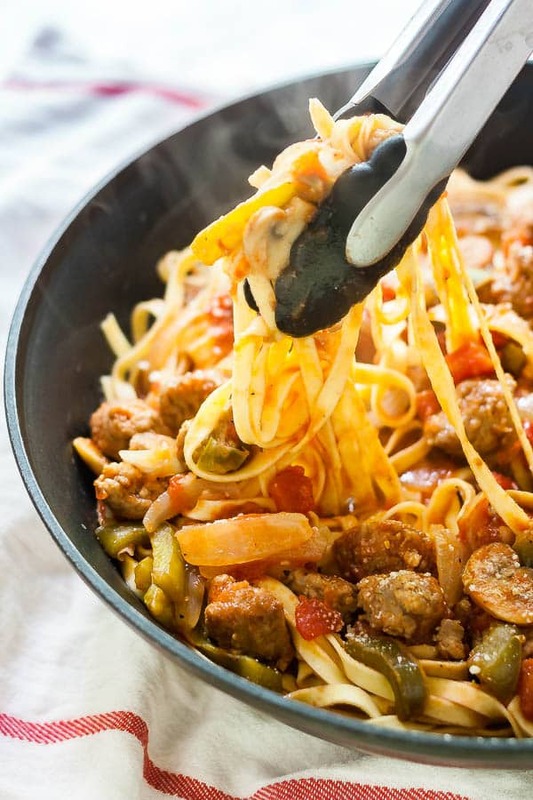 I love how quickly and easily this Italian sausage pasta comes together; it’s the fantastic combination of minimal prep work, quick cook time and bangin’ flavor that makes it the perfect week night meal. No joke, I had this on the table just over 30 minutes! The other thing I can’t get over the flavor the wine adds in combination with the savory Italian sausage & peppers. That being said, I know using wine is not for everyone. So if cooking with booze isn’t your style, I’m sure this will still be tasty if you substitute chicken broth for the wine. I used sweet Italian sausage but if you prefer spicy flavors, feel free to use spicy Italian sausage. A good hack to make this healthier is to use turkey or chicken sausage instead of pork sausage. You can take it a step further but subbing in zoodles. If you go the zoodles route, just make sure you add them in for the last couple minutes of cooking- you don’t want them to go too long because they’ll get soggy. If possible, use fresh pasta, it’s SO much better! If you happen to have leftovers, this reheats really well and makes a pretty tasty lunch! I shared it with one of my friends at work. She started off by saying she wasn’t hungry and ended up cleaning house on that plate once she got a taste. Finish it off with a sprinkle of Romano cheese, crushed red pepper (if you’re feeling spicy) and a hunk of crusty bread and you’ve got yourself a bangin’ little meal! 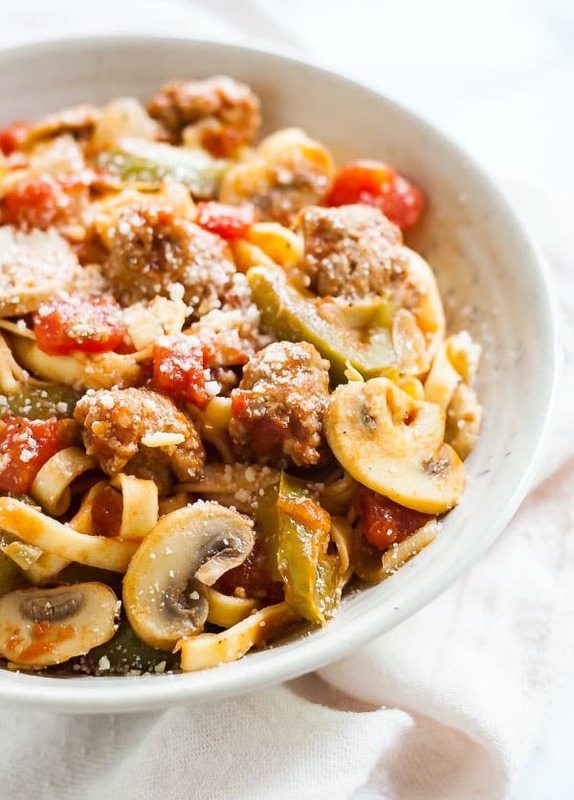 This Sausage Pasta with Peppers and Onions recipe is such an easy dinner! 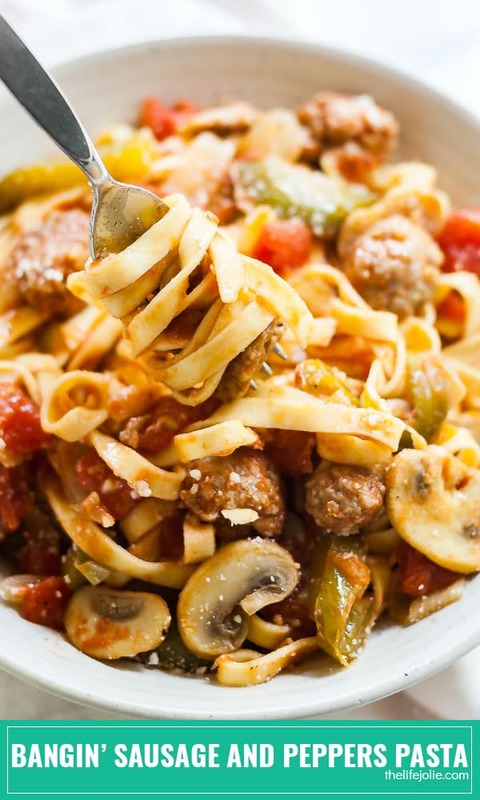 Sausage, peppers, onions, mushrooms and garlic combine with diced tomatoes and white wine to make a simple Italian meal. 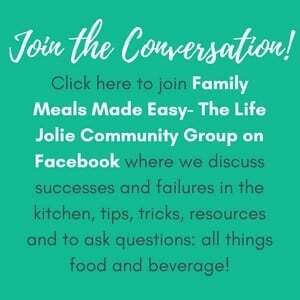 This is a delicious, quick weeknight dinner for families and a great date night meal for couples! Heat the oil over medium-high heat in a large saute pan and start a separate pot of water on a another burner for the pasta. Once the oil is hot add the peppers, onions, mushrooms and garlic and sprinkle a little salt and pepper on them to taste. Saute for around 7 minutes stirring frequently to soften. Remove the veggies to a side bowl and add the sausage to the pan. Stir them frequently, turning until they've browned, about 3-5 minutes. Add the diced tomatoes, salt and pepper and the veggies back into the pan. Bring it to a boil and then reduce the heat to medium/medium low and let it simmer for around 15-20 minutes, stirring periodically (during this time you'll also cook your pasta to al dente as per the package directions and drain it when it's done). Add the drained pasta to the sauce and toss to combine. Sprinkle on some Romano cheese and crushed red pepper and serve immediately. 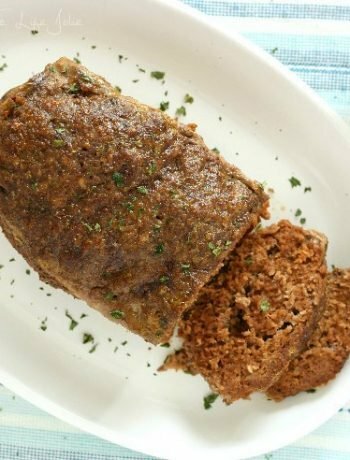 This lasts up to a few days in the refrigerator and reheats well in the microwave. October 17, 2016 at 2:02 pm Thank you! It's definitely high on our list of tasty flavor combos as well. February 14, 2018 at 2:43 pm So creamy and comforting! February 16, 2018 at 9:22 am This pasta looks yummy, always love such quick dinner ideas! February 17, 2018 at 8:16 pm Thanks Richa- me too!